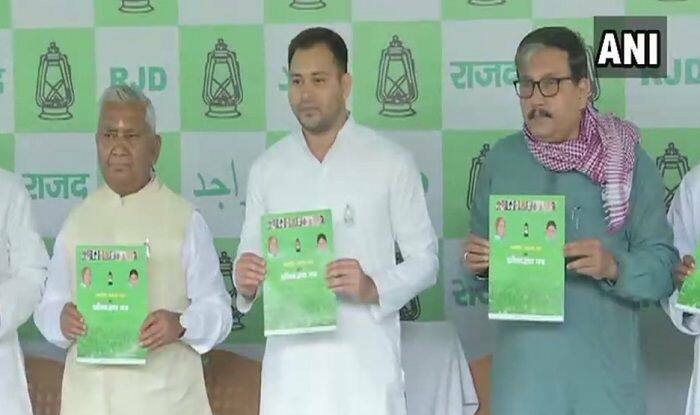 New Delhi: Rashtriya Janata Dal (RJD) leader Tejashwi Yadav on Monday released his party’s manifesto for the upcoming Lok Sabha elections 2019. The RJD, in its manifesto titled ‘Pratibadhata Patra’, promised reservation to Dalits and the backward classes on the basis of their population. Like Congress, the RJD also vowed to fill all vacant government posts. Besides, the party also assured implementation of Mandal Commission if voted to power. Addressing the media, Yadav claimed that his party’s proposed blueprint in the manifesto is going to help uplift the poor and farmers in the society. “RJD has always favoured reservation in private sector. we will ensure it becomes a reality,” said the former Deputy CM. At the manifesto launch, Tejashwi Yadav also extended his support to Congress’ NYAY scheme, under which the grand old party has promised to provide Rs 72,000 every year to 20 per cent poor families. Bihar will vote in all the seven phases of the elections, starting April 11. The counting of votes will take place on May 23. Meanwhile, the Bharatiya Janata Party (BJP) is also expected to release its manifesto for upcoming Elections at party headquarters in the national capital. The ‘Sankalp Patra’ will be launched in the presence of Prime Minister Narendra Modi and party president Amit Shah, reports said. The ruling party had formed a 20-member manifesto committee, headed by senior party leader and Union Home Minister Rajnath Singh, including Union Finance Minister Arun Jaitley among others.